Although I’ve lived here for 17 years now, I’ve never been a big one for taking advantage of London’s art galleries and exhibitions, and if I’m honest I’m much better acquainted with the city’s cosy little backstreet boozers than I am with its culture. Last weekend was an exception, though, because it had a mountaineering theme. I met my friend Thierry for a pub lunch, where we discussed among other things, my forthcoming expedition to Denali, his plan to climb the Matterhorn, and a trip we both have planned to Patagonia over Christmas. I then spent the remainder of the afternoon at a pair of exhibitions the Royal Geographical Society has organised to celebrate the 60th anniversary of the first ascent of Everest by Edmund Hillary and Tenzing Norgay. The first of these was an exhibition of photography primarily from the 1953 Everest exhibition in the Oxo Gallery in the ground floor of the Oxo Tower. Originally built as a power station in the 19th century, the Oxo Tower was subsequently bought by the manufacturers of Oxo beef stock cubes and converted into a cold store. In the 1990s it was refurbished and the surrounding buildings were converted into private accommodation. The tower stands in a prominent location on the south bank of the River Thames, and on an evening the word OXO lights up in red neon letters and is visible from Victoria Embankment and Blackfriars and Waterloo Bridges. It now has a rooftop restaurant run by the posh clothing store Harvey Nichols, and is quite a trendy place to dine (or so I understand). I had never been there before, and although I must have walked past it many times I’ve never really paid much attention to it. I found out why. Up close the tower is a tiny finger of concrete, in many ways quite ugly, sticking up above an innocuous shopping arcade. Thierry was even less impressed by the exhibition, but he’s quite a talented photographer with something of an artistic inclination (you will see what I mean after a quick glance at his Flickr site). There have been many times I’ve been on an expedition with him and looked round to see him lying on the ground with his camera to his face, or contorted into a curious position photographing a bit of tree bark or somebody’s foot. To be fair he also takes some amazing pictures of mountains as well, but these are only a small part of his portfolio. He remarked that many of the photos in the exhibition had not been very well composed, and that today’s mountain photography is of a substantially higher quality. 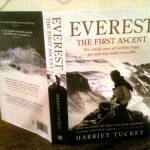 An example of this is Tenzing’s summit photo, which could have been taken anywhere. Hillary could easily have posed the photo looking down the Southeast Ridge they had ascended, or with the giant pyramid of Makalu in the background, but he didn’t. It looks more like a quick snap, almost as an afterthought. On the other hand, it’s not that surprising either. Hillary was knackered, and famously forgot to give the camera to Tenzing to have a photo of himself taken in return. The reason you see no summit photos of Hillary is because there aren’t any. I’ve also been too exhausted to pay much attention to my summit photos on many occasions. For me the photos should be thought of as a great historical record rather than for their artistic merit. George Lowe testing a “portable” radio which looks like it was invented by Heath Robinson as Hillary looks on smiling with his ice axe buried in the snow, a Sherpa crawling across an aluminium ladder in the Khumbu Icefall with an equally long ladder strapped to his back, Lowe having his hair cut by Charles Evans at Base Camp (nobody bothers with that sort of thing these days, but in the 1950s grooming was important), and Hillary checking Tenzing’s oxygen equipment before leaving camp in the Western Cwm are among the many gems. My favourite photo is the one of Charles Evans and Tom Bourdillon slumped on a rock at the South Col, staring at their feet totally dejected and exhausted after returning from their failed summit attempt. I can only imagine the conversation which must have taken place between them and the photographer Alfred Gregory with all the winds of Asia howling past. Although he didn’t say so, Thierry would have been pleased that one aspect of the show was akin to that of a proper art exhibition: the prices. The organisers were selling luxuriously mounted prints of the photographs for prices that started at £260 for an unframed 16″ x 12″, rising to a jaw-dropping £740 for a framed 22″ x 18″ snap. To put this in context, at a travel show last year I bought a signed 20″ x 12″ print of Doug Scott’s famous photo of Dougal Haston climbing the Hillary Step in 1975 for a tenner. The proceeds went to Scott’s charity Community Action Nepal; I have framed it and it now occupies pride of place on my wall. It’s a shame the organisers of this particular exhibition were only targeting buyers with more money than sense, and I imagine they managed to annoy quite a few people who otherwise might have bought something. I contented myself with buying a glossy coffee table book of the photographs for 40 quid, and only felt like a mug once I got home and realised I could have bought it from Amazon for just £22. Still, at least the exhibition was free to get in, so I suppose I can’t complain that much. I jumped on the Circle Line and crossed London to South Kensington, where the Royal Geographical Society have their offices in a smart building opposite Hyde Park. I’ve been there many times to attend lectures by well-known mountaineers and explorers, and they’re currently running another free exhibition there called Innovation Everest about the technology used on the 1953 Everest expedition. A lot has been written about the closed-circuit and open-circuit oxygen systems. The closed-circuit system recycled the oxygen in the tank, but did not allow the wearer to breath air from the outside. Although in theory it was a more efficient system than the open-circuit, it was also less well-developed and much of the work had been carried out by one of the climbers, Tom Bourdillon and his father, who were both engineers. Two days before Hillary and Tenzing reached the summit, Bourdillon and Charles Evans got as far as the South Summit, just 90 vertical metres away from the main summit, when Evans’ oxygen equipment packed up. Bourdillon considered going on alone, but it was 2pm and he estimated it would take another 3 hours to get there. Although he expected to reach the summit he didn’t think he would get down alive, and they both turned back. 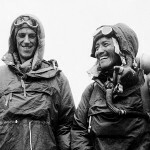 By contrast Hillary and Tenzing used the open-circuit system, which didn’t recycle the oxygen but allowed the wearer to breath in ambient air as well. This system had been in use for much longer, was considered more reliable and was eventually proved so. The exhibition covered many different aspects of technology and equipment used on the 1953 expedition, including boots, tents, photographic equipment and medicine. Another important consideration was bridging equipment for getting through the crevasses of the Khumbu Icefall. 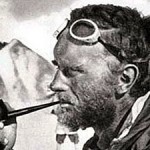 Eric Shipton’s 1951 reconnaissance was turned back by a giant crevasse at the top of the Icefall, which was bridged by a Swiss team the following year by climbing a considerable distance down into it to find a snow bridge they could cross. One of the team members climbed back up the other side and attached a rope across the crevasse which they could cross by means of a Tyrolean traverse (and if you’re wondering what that is, here are some photos of one in action). This doesn’t make it easy for porters, so the 1953 team were the first to take 5m aluminium ladders. Nutrition was another matter given a great deal of consideration. High altitude ration packs were pre-assembled which included 5 sheets of toilet paper per climber. If this doesn’t sound like enough I should point out that appetite loss is extreme at that altitude, and in the case of some people they would be carrying 5 sheets of unnecessary weight. I usually like to get out of London on weekends, but last Saturday I had an enjoyable afternoon here. If you want to catch the two exhibitions then you’ll have to be quick. The art exhibition ends this Sunday, 9th June, while Innovation Everest continues until the following Friday, 14th. If you’re interested in the photos then you can always buy the book from Amazon, and if you want to know more about the technology then a new biography of Griffith Pugh has just been published, a member of the 1953 team who pioneered much of the technology. It was written by his daughter, and although I haven’t read it yet it’s on my reading list. 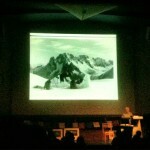 There’s also a little 5 minute video about the Innovation Everest exhibition on the BBC website. ← Is it a bad thing the world is becoming more accessible?